Home › Knowledge Center › Which is the most translated website in the world? There are literally millions of websites out there, many of which contain several languages. Translating a website has become nowadays a basic business requirement. But which is the most translated website in the world? Which website is the champion when it comes to offering language versions of its content? The nearest any other website comes to offering information is Wikipedia, a worldwide community effort, with 287 languages. The first commercial website is Apple’s, which is translated into some 130 languages. 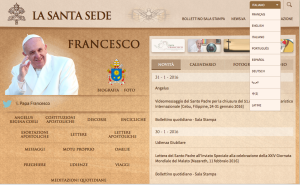 The Vatican’s website is translated into 10 languages (including Latin). 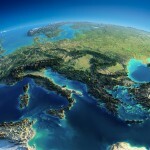 The European Union has 24 official and working languages, which are all national languages plus 2 regional languages (Welsh and Catalan) which can be used co-officially in some documents. Translating religious texts into so many languages is not an easy or simple task. It requires the support of an eager community that wants to use translation as a means to convey an important meaning. In many ways, the effort by Jehova’s Witnesses and Wikipedia websites reflects the power of the community to translate information even if dealing with old texts. These translations would be too expensive to be undertaken by translation companies, as providers of such services are in high demand today. 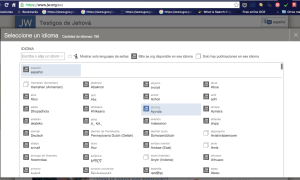 But why Jehovah’s Witnesses is the most translated website in the world? Any professional translator will tell you that translating a website into 5 or 10 languages, and managing translation and publication is no easy task. Translation in over 750 languages is a massive effort. Anyone who has been involved in website internationalization will refer to the team work and resources required. Jehovah’s Witnesses approach deserves a case study on its own for they have translated meticulously towards their goal and have succeeded in providing their audiences with the texts in the language of their choice. Other religions, even with far more reach, have not done so. Some say that the reason is because Jehovah’s Witnesses will immediately begin translating each of their publications into every language in which they proselytize. As they are engaged in spreading their word in virtually every spoken language in the world, they use each new publication actively and immediately in their activities. The approach of the organization to translation has largely been to turn all the content already published for decades in their paper versions (Watchtower Bible, etc). In the past, one could ask for a printed version of their publications which would be sent by post. However, once the Internet became a popular platform for communication, it was only natural that the organization replicate their pattern of using translations to convey their message in the new medium. It is curious, though, that other religions or groups that seek to recruit believers or proselytize have not used pre-Internet material to grow their websites. The Spanish translation of this article has reached 14k shares in Facebook alone. Wow that is amazing and quite surprising at the same time. I would never have guessed that the Jehovah’s witness website would outrank all others, they cover more languages than most of the big players combined! 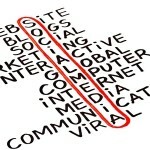 Very interesting article and you guys clearly seem to know the business of Website translation! The good news must be preached in all the earth. Jehovah’s witnesses are really doing the work. Am proud to be one of them. JW.ORG is the UNIQUE WEBSITE IN THE WORLD! Now that is literally speaking in tongues. jw.org is indeed a profound way to learn more about this marvelous God, Jehovah!!! The article states “they are engaged in spreading their word in virtually every spoken language in the world”. Correction! We are spreading Jehovah’s word in every spoken language. Praise goes to Jehovah, God. As of 2017 JW.ORG is translated into over 880 Languages and climbing monthly. Why? = ACTS 10:34-35; 1TIMOTHY 2: 3-4. THE MOTIVE = MATT. 22: 37-39. I just found out they are all volunteers…hats off! Yes Jehovah witnesses are all volunteers. Translation if is not all they do! Jehovah’s don’t get payed to build their Kingdom Halls, it’s voluntary donations to afford their constructions and the builders are all volunteering Jehovah witnesses – there is over 60,000 halls. They go to relief work & go preaching in lands that are hard to get too, all and everything they do is voluntary! Not one of the Jehovah witnesses get paid for any of it, and they is over 8million of them. I’m proud to be studying the bible with them. I’m a teenager and have found meaning to life. Hi, If you know another language, you may go to jw.org and see the quality of the translation by comparing the English text versus that of the other language. Observe also the quality of characters used by jw.org for rendering different language scripts. As of August 28, 2017, it is 909 languages. This can only be accomplished because no Jehovah’s Witness in the world is paid for their hard work, all the way to the top. We do this for the love we have for mankind and Jehovah. It is Jehovah’s will ‘that all SORTS OF PEOPLE should be SAVED and COME to an ACCURATE KNOWLEDGE OF TRUTH’- I Timothy 2:4. So this is JEHOVAH OWN WORK AND IT IS VERY GREAT IN OUR VERY EYES. A SIGN THAT JEHOW LOVES YOU. http://WWW.JW.ORG IS IN YOUR LANGUAGE. VIST AND ENJOY GOD’S OWN WORK MORE THAN THE SKY YOU SEE AT NIGHT. As of November 1, 2017, JW.org has officially hit 920 languages in translation. It is poised and well on its way to hitting 1,000 languages globally. Despite natural disasters, terrorism, wars and reports of wars – there is a bright future for mankind that Jehovah God has promised. If you would like to learn how you can be a part of this, please visit jw.org and select the “Request A Bible Study” link. Someone will contact you shortly, totally free of any charge at any time. Wow that is astonishing and very amazing in the meantime. I could never have speculated that the Jehovah’s witness site would outrank all others, they cover a greater number of dialects than the vast majority of the huge players joined! Exceptionally fascinating article and you folks unmistakably appear to know the matter of Website interpretation! Thank you for this informative article. It does not matter how many or how few, Jehovah, the Creator and true God, wants everyone to hear the Good News that soon sickness, sorrow, death inherited from Adam, , wickedness and pain will be gone. People of ALL languages need to hear, listen and read of this marvelous hope in the language of their heart. The true God has moved His people to make it happen. Everything we do is on a volunteer basis. We are not paid for this wonderful provision. Nor do we charge. Our beautiful organization is a real miracle on the earth today. There is none like it. How unlike the selfish, materialistic, prejudiced world we live in. I cannot express how proud I am to belong to Jehovah’s Witnesses for 45 years. I plan on being a servant of Jehovah forever if he’ll have me. JW.ORG is now translated into 990 languages!! Thanks to Jehovah got this amazing achievement . He has really turn his people into a publishing powerhouse. I just recently started reading and writing the Jamaican Creole. I am happy that they publish material Inna Jamiekan Kriyuol (patwa). Mi glad bag bus! We love Jehovah first and he has blessed our efforts. We love and care for our neighbor no matter how far away they are and no matter how different they may be.